Seattle’s Fleet Foxes have continued to nurture their own course in music without bucking to popular trends or the pressures of commercial necessity. Their new album, Crack-Up (Nonesuch), six years in the making and only their third full-length album, is a grand affair with sweeping musical dynamics and tales about Greek nymphs, personal doubt and the fragility of life. It was recorded in six different studios in six different cities in the United States and clocks in at 55 minutes. I mention these facts because Crack-Up is best heard in one sitting. It's symphonic-like in structure; most of the tracks segue from one to the other, joining the individual parts of the whole work. 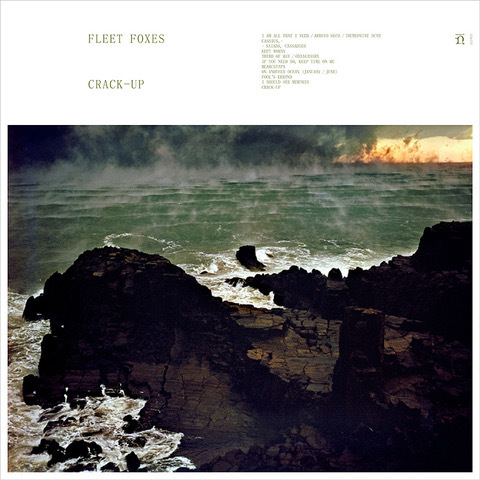 As with many of the prog-rock albums of the seventies, the music, tales and their structure suggest a concept album, but Fleet Foxes are known as contemporary folk band in most circles, so Crack-Up is a roots hybrid; grand in scope but without the spectacle and technical self-indulgence of progressive rock. 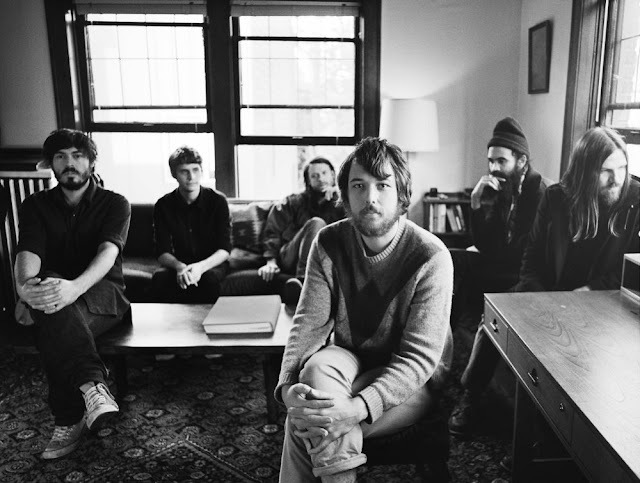 Fleet Foxes's principal songwriter is Robin Pecknold, who started writing songs as teenager. Growing up in Seattle, Pecknold didn’t find much stimulation in the grunge music scene popularized by Nirvana, because he was inspired by the work of Bob Dylan and dedicated himself to the folk/roots tradition. In 2006, at the age of 20, Pecknold formed the band Fleet Foxes with his friend Skyler Skjelset, whom he had befriended in high school. The pair shared a fondness for the music of DNeil Young as well as Dylan, two artists equally at home in rock, folk and country music formats. That blending of acoustic and electric sounds came to distinguish Fleet Foxes. Like their first two albums, Crack-Up is very much a mix of the quiet, acoustic sounds of folk with the louder, more energized sounds of rock’n’roll. But unlike in the progressive rock bands of 40 years ago, such as Yes and Genesis, the musicianship is not as sophisticated or technically astute. Fleet Foxes play their instruments well, but you won’t hear any extended keyboard or guitar solos typical of the genre. Crack-Up takes its name and inspiration from a series of essays by F. Scott Fitzgerald that were published in Esquire Magazine. Written across three separate issues, the piece is one of the most insightful examinations of an artist’s creative breakdown and how he coped with it. Fitzgerald goes uses long-winded sentences to explain how he cracked up after all the fame and success he had achieved as a writer in his youth. It’s a cumbersome read but interesting to anyone in a creative slump. I certainly learned a lot about Fitzgerald as a thinker, someone who understood how humans struggle with choices, particularly when they have too many. His essay was pulished in Esquire in 1936, near the end of his career, and I couldn’t help but think of it as a literary hangover dissertation. Fitzgerald was a heavy drinker and the essay reads like a long, drawn-out morning- after “hair of the dog.” Robin Pecknold was influenced by a few of the many philosophical nuggets in Fitzgerald’s piece, specifically the notion of a cracked dish and whether it is “worth preserving.” Fitzgerald writes, “The cracked plate has to be retained in the pantry, has to be kept in service as a household necessity. It can never again be warmed on the stove nor shuffled with the other plates in the dishpan; it will not be brought out for company, but it will do to hold crackers late at night or to go into the icebox under leftovers . . . " It’s an interesting metaphor for a struggling, self-conscious writer looking to recoup his muse, but offers only a gateway into Fleet Foxes's latest recording. There’s a little more going on in Pecknold’s eleven songs here. The cover image on Crack-Up offers an important clue to the record’s focus. It’s a photograph by Hiroshi Hamaya capturing the rocky shoreline at Tojinbo, Japan – famous, unfortunately, as one of the places where people go to commit suicide. Its 70-foot cliffs rise from a rough sea formed by volcanoes millions of years ago. The clashes of the salt water against the rocks have greatly eroded them over time. In musical terms this is how Crack-Up plays out. It ebbs and flows like an ocean crashing against the rocky shore right from the first track. Long periods of calm interrupt the pace of the continuous flow of the musical soundscape on the record. Pecknold’s subjects ebb and flow as well as he taps into mythology on “Naiads, Cassadies” with references to ancient Romans (“Cassius”). Fleet Foxes hit the road this summer with a tour that includes two sold-out shows in Toronto’s Massey Hall next month and dates in the United States and Europe through December.